Egg production in the Americas has increased by 2.2 per cent per year since 2000, maintaining the region's share of global total at just over 20 per cent, according to market analyst, Terry Evans, in his latest review of the trends in the world egg business. Having slowed between 2009 and 2012, global egg production has since accelerated with the total likely to have exceeded 70 million tonnes last year. This figure includes hatching eggs which, on a worldwide basis, accounts for about five per cent of all eggs. Growth averaged some 2.7 per cent per year between 2005 and 2009 but in 2010, it slipped to 2.1 per cent. In the following year, it declined further to 1.9 per cent and in 2012, the gain was just 1.4 per cent. Over the 12 years to 2012, production grew by an average of 2.2 per cent per year, rising from 51.1 million tonnes to 66.3 million tonnes (Table 1 and Figure 1). In 2013, world production increased by three per cent, bringing the total to 68.3 million tonnes. With the annual increase continuing to expand by more than two per cent, output in 2014 will have come close to 70 million tonnes, while in 2015, it will approach 71.5 million tonnes. Professor Hans-Wilhelm Windhorst, the International Egg Commission’s Statistical Analyst has forecast a global production of 86.8 million tonnes by 2030, recording an average annual growth of around 1.5 per cent per year. Since 2000, the total number of layers (including breeders) has risen by almost 2,060 million (41 per cent) from almost 4,976 million to 7,035 million, of which the Americas accounted for 856 million (17.2 per cent) in 2000 and 1,091 million (15.5 per cent) in 2012. Egg production in the Americas has increased by 2.2 per cent per year since 2000, growing from 10.5 million tonnes to 14 million tonnes in 2013. Consequently, this region has maintained its contribution to the global total at 20.5 per cent despite the decline in the proportion of layers, as the average egg weight is significantly higher than in Asia and Africa. 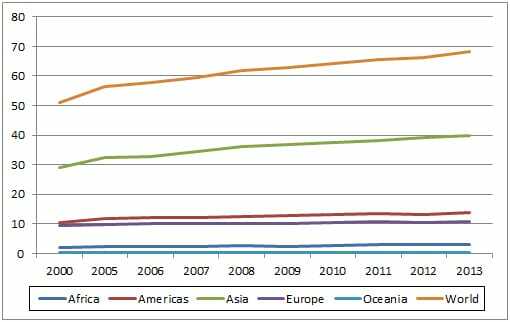 When compared with 2000, global production increased by 17.2 million tonnes by 2013. However, while output in the Americas went up by 3.5 million tonnes, the comparable figure for Asia was 11 million tonnes with Europe and Africa recording gains of 1.4 million tonnes and 1.2 million tonnes, respectively. In 2013, the Americas produced 14 million tonnes of eggs. This total should surpass 14.5 million tonnes in 2015. As in the other major egg-producing regions, relatively few countries account for the bulk of production (Tables 2, 3, 4 and Figure 2). The United States on its own, with a production of 5.64 million tonnes in 2013, represented more than 40 per cent of the regional total. Mexico and Brazil took second and third spots in the production league table with 2.5 million tonnes and almost 2.2 million tonnes, respectively. These three combined produced 10.3 million tonnes in 2013 or almost three-quarters of the total for the Americas. Colombia took the fourth spot with some 668,000 tonnes while, although output in Argentina actually contracted when compared with 2012, this country still commanded fifth position with just under 540,000 tonnes. It must be remembered that statistics can vary markedly depending on the source. Hence, in contrast to the FAO data, the representative for Argentina attending the International Egg Commission conferences reported that egg production in Argentina fell from 734,000 tonnes in 2012 to 692,000 tonnes in 2013. Outside of this leading group, quite a number of smaller countries recorded substantial gains during this review period. 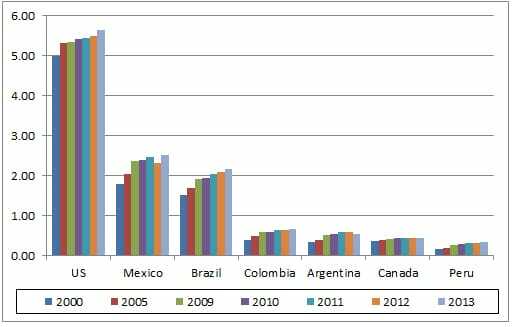 Output in Guatemala almost trebled to 2013, while production in Peru, Paraguay and Panama broadly speaking doubled. Egg production in the United States expanded by less than one per cent per year over the 13 years to 2013 and long-term projections to 2023 point to continued slow growth as output (including hatching eggs) climbs to some 8,727 million dozen from the 2014 estimate of 8,237 million dozen. In the US, hatching eggs currently account for around 12 per cent of total production, this figure possibly rising to around 13 per cent by 2023. If hatching eggs are removed from the calculations then table egg output looks likely to expand from around 7,086 million dozen to 7,595 million dozen between 2013 and 2023. The FAO assessment of US total egg production for 2012 of 5.2 million tonnes appears to be understated, the actual figure being likely to be closer to 5.5 million tonnes, which would increase the total for the Americas to around 13.5 million tonnes. There are a little over 300 million table egg layers in the US, of which some 51 per cent are in just five States – Iowa (58.1 million), Ohio (29.7 million), Indiana (26.6 million), Pennsylvania (24.1 million) and California (15.2 million). Currently, there are some 171 egg-producing companies with flocks of 75,000 or more birds representing 99 per cent of all layers. Back in 1994, about 350 companies owned flocks of this size. Some 64 companies with one-million-plus layers represent approximately 87 per cent of total production. There are 17 firms with more than five million layers. In May 2014, more than eight million layers were in organic systems, while a further 8.5 million were in cage-free housing. New cage-size regulations imposed in California have widened the price difference between California and other US markets. California is a deficit egg-producing area, having to import large quantities from other States. Some 94 per cent of the US flock is in cages, and about 93 per cent of all eggs are white. Of an estimated 229 million cases produced in the US in 2013, 122.1 million (53.3 per cent) were retailed, 22.9 million (10 per cent) went to food-service outlets while 10.7 million (4.7 per cent) were exported. Some 73.3 million cases or nearly one-third were broken out and further processed for food service, manufacturing, retail and export markets. Between 2000 and 2011, the egg industry in Mexico expanded by almost three per cent per year (Tables 2, 3, 4 and Figure 2). In the summer of 2011, the industry in Jalisco, the country’s most poultry populated state with some 150 million layers plus replacements in a radius of less than 150 miles, was hit by outbreaks of the highly pathogenic H7N3 strain of avian influenza. Fortunately, a vaccine which was developed specifically for this and made available within four weeks after the first outbreak, proved to be effective. Some 100 million birds were vaccinated. Final losses to the disease and depopulation have been put at 25 million birds. As a result, production over the year was cut back by some six per cent to 2.32 million tonnes. A recovery became evident in 2013 as output climbed to a record 2.5 million tonnes, while for 2014, the Mexican Poultry Producers Association (UNA) has postulated an output of 2.56 million tonnes. The USDA FAS has forecast a further increase to 2.6 million tonnes for 2015. All birds are housed in cages while the ratio of white to brown eggs is 96:4. Egg output from Brazil grew at an annual rate of 2.8 per cent between 2000 and 2013 as it climbed from 1.51 million tonnes to 2.17 million tonnes. All birds are in cages, while the proportion of white to brown eggs is 77:23. Although Colombia is the fourth largest egg producer in the region, output at around 670,000 tonnes a year lags well behind that achieved by the top three countries. Nevertheless, between 2000 and 2013, its industry chalked up a commendable 4.3 per cent per year growth. Here only 30 per cent of birds are in cages as some 70 per cent are housed in a barn system. Around 92 per cent of the eggs are brown-shelled. Recording an average annual increase of more than five per cent to 2012, egg output in Argentina almost doubled to reach 600,000 tonnes. However, the industry went through a difficult period in 2012/2013, such that production was cut back significantly. But now a recovery is forecast on the back of an increase in domestic consumption and an anticipated expansion in shell egg exports. Some 85 per cent of birds are in cages, with 10 per cent in barns and five per cent on free-range. The white to brown egg ratio is 60:40. The egg industry in Canada recorded slow growth between 2000 and 2005 at just 1.5 per cent per year. Since then, the gain has been slightly less than this. This country has just over 1,000 registered egg farms while, although there are some relatively large units with more than 400,000 hens, the average flock size is around 22,300. Production is organised under a National Supply Management system. Ontario has about 37 per cent of the national quota and Quebec 19 per cent, while the Western Provinces and the North West Territories have a combined production quota of almost 37 per cent with the Atlantic Provinces taking a little less than eight per cent. Some 94 per cent of production comes from cage systems. Around 90 per cent of eggs are white-shelled. About 70 per cent of eggs go to the table market, the remaining 30 per cent being broken out for the manufacture of value-added and other liquid or frozen products. The rate of future growth is thought unlikely to change significantly from current levels. Peru has noted dramatic gains in egg production, which have averaged some six per cent per year from 2000 to 2013 when it reached a new 'high' of 350,000 tonnes. Some 99 per cent of Peruvian egg production is brown-shelled, while the proportion of the flock in cages is 84 per cent with 10 per cent in barns and six per cent on free-range.